We know that October 4 holds a special place in most people’s heart, what with it being National Ten-Four Day and all, but lay down those CB radio mics and put your ears on, good buddy. Battleswarm: Field of Honor has begun its open beta and wants us to join them for an all day tournament this Sunday, with a chance to win fame and fortune. Well, only fortune really; but it is in-game fortune, so it will be massive amounts. Battleswarm, made by Gameworld Tech and published by Reality Gap, is a genre-bending online PC game in which we can choose to take on the role of a Human soldier and battle it out in tactical, FPS style with superior firepower and teamwork. Alternatively, we can choose to go the RTS route and play as a Bug Commander, in charge of hundreds of alien bugs which battle the Human team strategically rather than using the run-and-gun style. Prizes, like 100,000 MetaTIX, the universal currency for online games, and over 2 million in-game gold, can be won in a variety of categories, including Best Overall Player, Best Human Player, and Best Bug Player. 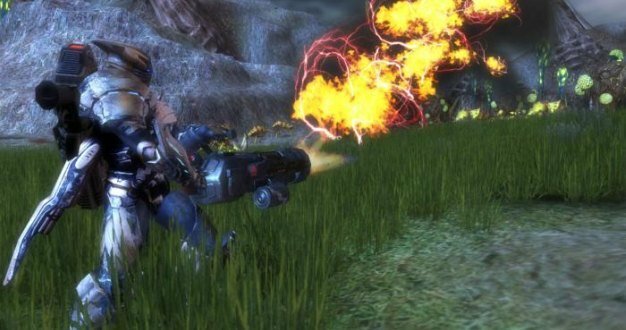 The MetaTIX can be spent within Battleswarm when the game goes public later this October, or can be spent immediately within Monato Esprit, a MMORPG also published by Reality Gap. The in-game gold, however, can be spent immediately and used for game upgrades, like flamethrowers and better insect breeds. We are definitely going to check this out, and you can too by going here. Let us know in the comments if we squish you under our boot of freedom.